Are Your Breasts to Blame for Your Back Pain? Although many women desire large breasts, they are not always all that they are cracked up to be—at least the non-augmented ones. Women with naturally very large breasts frequently suffer from a variety of associated symptoms and issues due to their substantial weight and overall size. Some of these include neck, back, and shoulder pain, shoulder grooving, postural changes, rashes, skin breakdown, foul odors, and unwanted attention. The back pain experienced by these women is a response to the strain placed on the muscles and ligaments and is often linked to poor posture. Maintaining proper posture is difficult for women with larger breasts due to the extra weight on the chest as well as their effects on the center of gravity. This weight pulls the shoulders downward, causing them to hunch forward. A strong second reason for this poor posture is that many women with large breasts are self-conscious and hunch their shoulders on purpose to minimize the appearance of their breasts. This constant hunching of the shoulders also leads to spinal deformity and therefore additional back pain. Back pain is frustrating and can seriously impact one’s quality of life. If you are suffering from this chronic pain, activities such as exercising or sports can be difficult and painful even if you are wearing the most supportive sports bras that you can find. Because of this, many women with large breasts avoid significant physical activities in general and, therefore, the enjoyment associated with them. In addition, not only are they missing out on exercise that will make them healthier in the long term but they also tend to gain a substantial amount of weight over time because they are unable to burn off more calories, leading to even larger breasts. Non-surgical remedies for breast-related back pain include focusing on good posture and muscle strengthening in order to help relieve some of the pressure on the spine. Unfortunately these are virtually always very short-lived, incomplete solutions. Breast reduction is the only sure way to reduce this breast-related back pain. 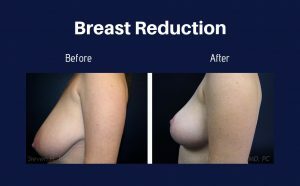 Breast reduction is a surgical procedure that removes excess tissue from very large breasts and then lifts and reshapes them so as to create a more aesthetically pleasing contour as well as diminishing stress on the spine and shoulders. Not only will you be able to participate in more activities and wear a wider variety of clothing, but you will also be able to feel far more comfortable doing so. If you are suffering from chronic back pain and you think your breasts are to blame, contact Dr. Turkeltaub at the Arizona Center for Breast Surgery by calling (480) 451-3000 or by filling out our online contact form.